A recent research study by Fact.MR finds that the microreactor sales reached 294,000 units in 2018 and are projected to grow at a Y-O-Y of nearly 9% in 2019. Increasing competition among manufacturing companies in order to develop finer products remains a key aspect spurring the demand for microreactor technology. Ability of microreactor technology to facilitate effective and efficient drug synthesis is one of the key factors responsible for its rising adoption in the pharmaceutical industry. 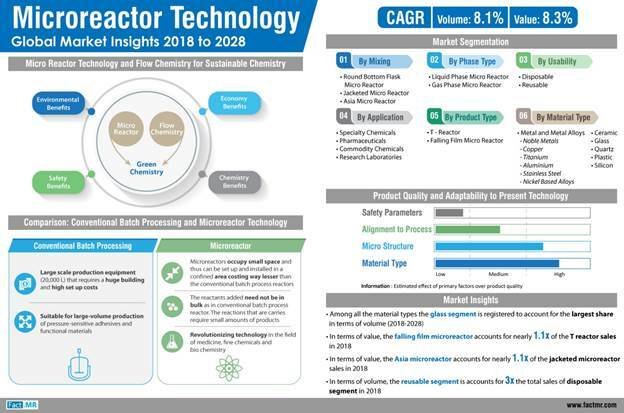 The report finds that increasing demand for process intensification has inspired various chemical industries to adopt microreactor technology. Capability of microreactor technology to enable continuous reactions in small channels instead of large-scale components, which results in effective mixing of the reagents and seamless heat transfer, is enhancing its visibility as compared to the conventional technologies. Moreover, inherently safer design with high efficacy has also been identified to boost use of microreactor technology in challenging applications areas of the chemical industry. Use of microreactor has witnessed a notable rise in multiple industrial ecosystems, such as chemical and pharmaceutical, on the wake of its ability to offer high-throughput with use of minimum amount of pharmaceutical materials. Moreover, the one-step reactions enabled by microreactor technology aids in elimination of the risk associated with waste products, resulting in high-quality end-products, which drives its adoption across end-use verticals to achieve unparalleled productivity. The demand for falling film microreactor thrives on the back of its larger specific surface area as compared to the conventional reactors. Asia micro reactor remains the most prominent mixing type and is likely to witness remarkable growth in the forthcoming years, driven by efficacy in terms of resistance and transparency. Microreactor technology is becoming highly appealing to the production departments in the pharmaceutical industry, followed by specialty chemicals. Benefits of continuous-flow processes over batch chemistry remain instrumental in heightened adoption of microreactor technology in both pharmaceutical and specialty chemicals landscape, translating into fast-paced synthesis of organic compounds amidst hazardous conditions with minimized waste. Moreover, the adoption of microreactor technology also offers additional benefits in terms of capital investment and operating expenses with notable reduction of the ‘time-to-market’ aspect, which is bolstering its adoption across diverse end user industry verticals. Microreactor technology market is likely to grow at a volume CAGR of around 8% through 2028.